This work provides a posteriori error analysis for mathematical idealizations in modeling boundary value problems, especially those arising in mechanical applications, and for numerical approximations of numerous nonlinear var- tional problems. An error estimate is called a posteriori if the computed solution is used in assessing its accuracy. A posteriori error estimation is central to m- suring, controlling and minimizing errors in modeling and numerical appr- imations. 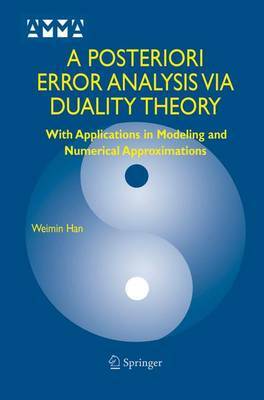 In this book, the main mathematical tool for the developments of a posteriori error estimates is the duality theory of convex analysis, documented in the well-known book by Ekeland and Temam (). The duality theory has been found useful in mathematical programming, mechanics, numerical analysis, etc. The book is divided into six chapters. The first chapter reviews some basic notions and results from functional analysis, boundary value problems, elliptic variational inequalities, and finite element approximations. The most relevant part of the duality theory and convex analysis is briefly reviewed in Chapter 2.